Duration : 1 hour 40 mins. "Kahani Teri Meri" is a very interesting offering from ace theatre writer and director Atul Satya Koushik who is known for his grand scale historical, musical and urban comedy plays. This play is a humorous yet thought provoking social commentary on our relationships with those who need our love and care more because of their age or difficult social, financial or physical condition. The play features legendary theatre actor Aanjjan Srivastava in the role of a story teller who takes the audience through slices of life in his own inimitable style which strikes and immediate chord with the audience. The show is based on two short stories penned by two of the most acclaimed story writers of Hindi literature in India i.e. Munshi Premchand and Dharamveer Bharati. The peculiarities of their respective writings find their own space in the play and an amalgam of both creates a visual spectacle on stage. Kaaki has given away all her property and belongings to her kins in exchange of some good food only to receive their disrespect and disdain and she continues to crave and wait for good tasty food. Gulki who has been ousted by her husband bears a hump on her back and trying to find some place in the village she once lived in and in the hearts of people she spent her childhood with. Hopes of both of them come down to a certain evening. Will Kaaki's hunger get quenched? Will Gulaki's respectable place in her own village be restored? Find these answers in this timeless saga based on timeless stories. Aanjjan Srivastav started his theatre journey in 1968 and completes 50 years of his theatre career this year. Almost all the plays he did in past 50 years were for IPTA. For the first time, he is working with a Group/Director outside IPTA. We feel blessed to have him introduced to commercial theatre in 50th year of his career. 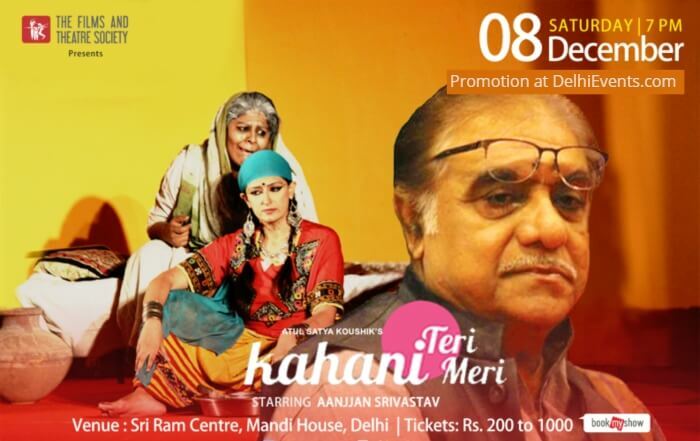 Watch this "legend in his own right" take you through the stories in Kahani Teri Meri on 08th December at Sri Ram Centre, Mandi House, Delhi. After doing more than 400 successful shows in different parts of India, The Films and Theatre Society is launching their old Production "Kahani Teri Meri" in a totally new Avatar.